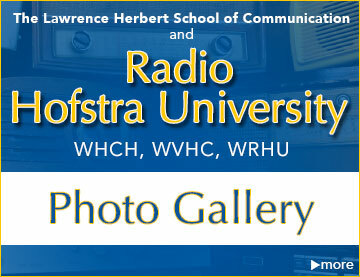 WRHU-FM is a cornerstone of the Lawrence Herbert School of Communication at Hofstra. In existence longer than any other noncommercial radio station on Long Island, WRHU has thousands of alumni stretching back over 50 years. More than 234 students participate at WRHU each year. WRHU was named #1 college radio station in 2018 by BestColleges.com. In 2017 the National Association of Broadcasters ( NAB )presented WRHU with a Marconi Award for Non-commercial Station of the Year. In 2014, WRHU was a trend setter becoming the first ever non-commercial radio station to earn an NAB Marconi Award! 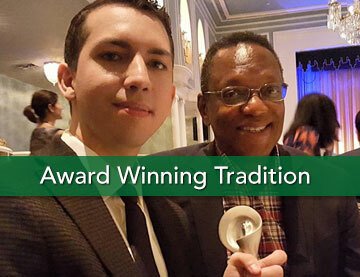 WRHU is the only non-commercial radio station to earn two Marconi awards from NAB. 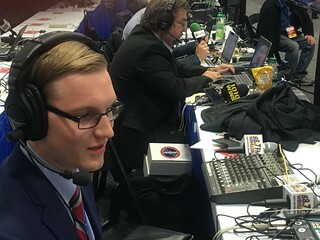 WRHU FM - Radio Hofstra University ranked number one - best college radio station - by Princeton Review twice and earned a Pinnacle Award from College Media Advisors for on-air quality and development of students. To provide professional broadcast training to qualified Hofstra University students. Pictured above smiling student (second from left) Steph Ruscio wrapping up sophomore year in a WRHU studio engineering a Mike Francesa live broadcast airing on WFAN AM/FM NYC. As a sophomore participant, she engineered all the NY Islanders live NHL playoff game broadcasts syndicated to Sirius XM, WCBS 880AM, and WFAN AM/FM in addition to engineering over 40 regular season NY Islanders games syndicated to Sirius/XM, WRCN LI and WNYE FM NYC. Many alumni go on to careers in media. WRHU is a leader in producing and distributing programming to partner AM / FM radio stations, new media outlets, and multi-media platforms. WRHU serves a diverse community broadcasting locally via 88.7 FM to Long Island, New York City, and parts of Connecticut. WRHU broadcasts worldwide via WRHU.org, the WRHU iPhone app, WRHU Droid app, Hofstra Athletic Web Channel (HAWC), GoHofstra.com, and NHL.com. 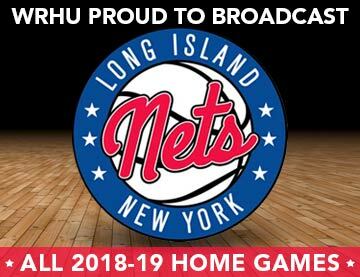 WRHU broadcasts select Hofstra Pride games and New York Islander hockey games worldwide via Sirius / XM Satellite radio. 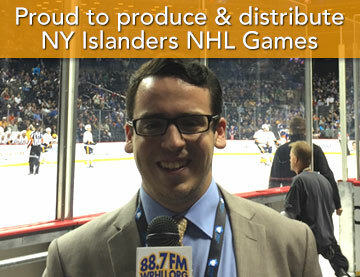 During the entire 2016-17 NHL season student staffers at WRHU produced NY Islanders live games to air on major NYC radio outlets, Sports-radio WFAN AM/FM, WCBS 880 AM, and Salem 970 AM & 570AM. 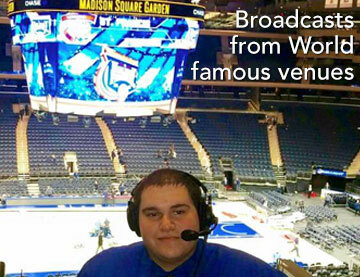 WRHU sometimes produces Hofstra Pride sports live game broadcasts and syndicates them to air on either WGCH AM in southern Connecticut and/ or WLIB 1190 AM NYC. 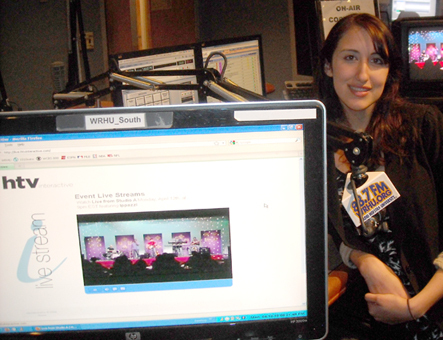 WRHU works with Hofstra Television Interactive (foreground left) and Hofstra Television channel 35 (background right) simulcasting live events (such as concerts from Herbert Hall Studio A - the largest TV soundstage on Long Island). Student broadcasters truly learn how to converge media and broadcast it on multiple platforms simultaneously. As you can see, student generated content from the WRHU studios takes many new media paths to reach audiences. WRHU has a very large vibrant award winning staff. WRHU has an operating staff of more than 270 (most of which are current Hofstra students). The student broadcasters at WRHU regularly produce and host programs which earn numerous awards from the National Association of Broadcasters / NAB, Associated Press, Society of Professional Journalists, Press Club of Long Island, Sportscasters Talent Agency of America, Alliance for Women in Media, IBS, CMA, and other organizations.. The Princeton Review has ranked WRHU FM #1 Best College Radio Station twice! CMA has presented WRHU with a Pinnacle Award as Best Station. The NAB has recognized WRHU with a Marconi Award as non-commercial station of the year in addition to naming WRHU as a finalist in the Marconi awards in two other years. School of Communication professionals Bruce Avery and John Mullen supervise station operations, provide broadcasting experience, and mentor students. A group of community volunteers offer life experience, individual talents and peer leadership. WRHU FM receives generous support from Plycon Transportation, Carmela’s Restaurant, Chateau Briand, The Fox Hollow Inn, St. Catherine of Siena Medical Center, James Metzger / The Whitmore Group, AT&T, Class A Roofing and Siding, and other companies / community members. This support helps WRHU FM achieve the mission of providing professional broadcast training to qualified Hofstra students. Check out our "support" and "alumni accomplishment" pages for more information. To participate at WRHU, all staff must complete a 10-week, non-credit course covering audio engineering, announcing, audio production, programming strategies, Internet broadcasting, FCC rules, and more. The course consists of classroom hours and in-studio workshops where students gain valuable hands-on experience. All staff must pass a written exam and a hands-on, in-studio equipment operating exam. After students complete the course, they have the ability to be mentored either one on one or in a small group setting by one of our in-house professionals. This deep, rich training is why WRHU is the number one college radio station for developing future broadcasters. Amazing opportunity is another reason WRHU is the best college radio station for pre-professional development. 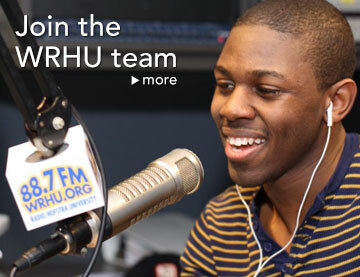 At WRHU students can develop their skills participating in one of many news programs, working on our many sports broadcasts, or hosting one of our many music programs. Students are encouraged to develop their skills in the area of marketing and promotions, technical engineering, and management. 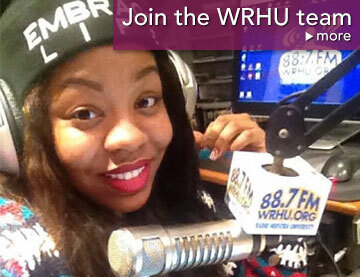 Apply now to join the WRHU team! As is the case with many extra curricular activities at many colleges, competition for participation is stiff. WRHU receives a very large number of applications each semester. Far more applications than we can accommodate in any given training class. Since WRHU has a long standing and very successful educational mission, current Hofstra students receive priority for all training classes. When completing a WRHU recruitment application, provide as much information about yourself (i.e., resume, personal statement, demo CD as you feel is necessary. If you have questions, call WRHU at (516) 463-4986. Fill out the application as completely as possible. Use a separate sheet of paper, if necessary. If desired, attach additional information (resumes, clips, demo material, etc.) about yourself.